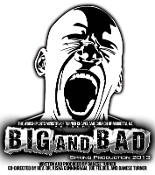 Our Products >> Turner Chapel Worship Arts Ministries "Big & Bad"
Turner Chapel Worship Arts Ministries "Big & Bad"
Why is there so much evil in the world? What’s going on? A relevant, action-packed story told through powerful acting, dance, mime, step, song, pageantry, and African drums! The news is filled with stories of face-to-face and online bullying, deception, shootings, killings, and robberies. What’s going on in the world? And how do we fix it? Does the answer lie within our churches? Our schools? Our homes? How do we impact change and get rid of evil in our society? Bring the whole family—especially youth—to see a powerful and action-packed theatrical experience which provides a snapshot of reality and depicts who’s really “Big and Bad”. A riveting story told through dance, mime, step, song, pageantry, and the commanding sounds of African drums! So get rid of all evil and all deceit and hypocrisy and envy and all slander. 15 For God wants you to silence the ignorance of foolish people by doing good.” – 1 Peter 2: 1, 15 (NET).